I did not grow up reading comic books. I was no fanboy. It was not until I was in graduate school and was desperately looking for things to do other than write my Master’s Thesis (I am a world-champion “productive procrastinator,” always reading avidly that which needs not be read at that given moment) that I discovered my then-roommates’ treasure trove of Marvel and DC comics. I had a lot of desperate fun learning about Spider-Man, Animal Man, the X-Men, etc. (but not Captain America, sadly), as well as discovering the fantastic graphic novels by Alan Moore, including The Dark Knight Returns, V for Vendetta, and Watchmen. I’m pretty sure I haven’t read a comic since. But the better stories still resonate, and in this age of comic-book movies – many of which just aren’t that interesting – I often long for a superhero movie that will give me good character-based drama, great action and topical relevance to the world we live in today (like much of Alan Moore’s work). Sadly, I rarely get what I’d like. The role of science fiction and fantasy should be to help us explore the important issues of our time in a seemingly alien context (what the Russian formalists called “estrangement“). This distancing device can, if handled properly, make us more receptive to the ideas therein, slyly working in societal critiques that we fail to interpret, at first, as anything more than fantastical plots. Little by little, we find ourselves hooked on the adventure, and only afterwards realize that we were reading a book or watching a movie about ourselves. Sometimes, messages are better conveyed in the guise of escapist entertainment than as sincere social commentary. 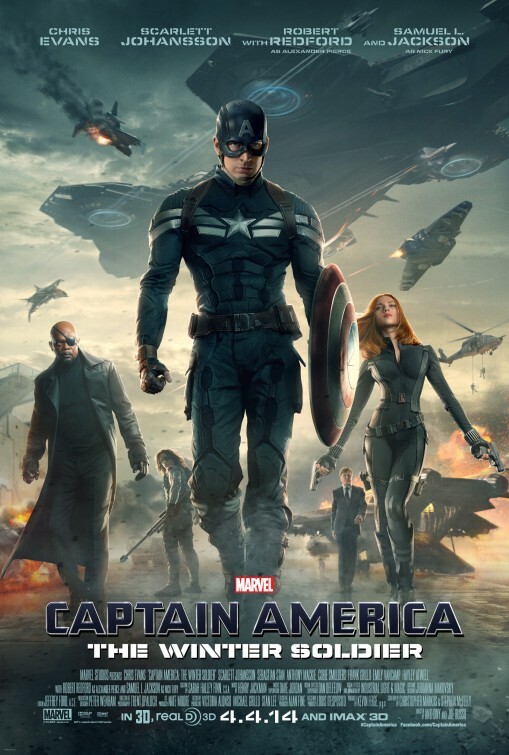 Captain America: The Winter Soldier is the kind of superhero film that gives us (or me, anyway) all of the action and adventure we need, great characters to root for (with little digital imagery to distract), and a terrific and timely politically paranoid plot that forces us to contemplate our contemporary lives in serious ways. I liked Captain America: The First Avenger (the first film in this series) better than any of the other “Marvel Universe” movies, including Iron Man, which I nevertheless enjoyed. That introduction to Steve Rogers – the 90-pound weakling who is transformed into a brawny super soldier by an experimental serum – featured Chris Evans (who had previously appeared in another superhero series, Fantastic Four, as Johnny Storm) as its protagonist, and he brought a warmth and humanity to the proceedings that made us truly empathize with Rogers’ demons, both internal and external. Rogers had grit and a strong moral compass – which is why he was chosen to be injected with the serum, rather than his healthier peers – and bore his “Captain America” moniker with grace and humility. Set during World War II, that film featured an inevitable showdown with Nazis and people even worse than Nazis, presenting familiar tropes with an energy reminiscent of the best Indiana Jones films. It also ended on a surprisingly melancholy note, as Rogers sacrificed himself to save the world, plunging his doomsday weapon-laden plane into the ice and freezing himself in the process. Captain America returned in The Avengers, a film I also enjoyed, but which featured too many competing characters (Hulk! Iron Man! Thor! etc!) for any single one to stand out. And, compared to his truly superhuman colleagues in that film, Rogers – just recently rescued from his icy grave and miraculously revived – seemed physically reduced. But now he gets his own movie again, or at least a movie in which he is the star. There are plenty of other terrific actors around to help him shine, however, including Scarlett Johansson as Black Widow (when will she get her own movie? ), Samuel L. Jackson as Nick Fury (the head of S.H.I.E.L.D. ), Robert Redford (yep – Bob has decided to lend his considerable talents to a superhero film, and we are very grateful) as Alexander Pierce, and Anthony Mackie (always appealing) as a U.S. Army veteran who is befriended by Rogers in a very funny opening scene. More importantly, the same screenwriters – Christopher Markus and Stephen McFeely – who made the first film such a winning combination of wit, heart, adrenaline and soul, are back for this second outing, and have here crafted a story that is superior to its predecessor. Brothers Anthony and Joe Russo – who haven’t made a feature film since the dismal You, Me and Dupree in 2006, but have been working in TV ever since – display a solid talent for working with their stars and staging the big set pieces, even if some of the later action sequences are a bit too chaotic to be coherent (though an earlier car chase scene with Samuel L. Jackson had me on the edge of my seat). It’s wonderful to see good actors delivering good performances, rather than the showboating we so often see in the Iron Man films. In Captain America: The Winter Soldier, the threat to our world comes from within. Following the massive chaos and terror unleashed in The Avengers, S.H.I.E.L.D. – basically, the NSA on steroids – has decided to develop massive gunships that can stay aloft virtually forever and eliminate terrorist targets, perhaps even before they commit any acts of terrorism in the first place (shades of Minority Report). When Nick Fury discovers an anomaly in the controlling algorithm, he orders a delay in the program’s implementation. After which, all hell breaks loose, since certain forces have their reasons for wanting the gunships to fly. At the center of the film’s plot is a very discussion of the ethics of violence-in-the-name-of-security, as well as of the dangers of the government’s ubiquitous data mining of the secrets of our lives. What would you trade in the name of ostensible safety? I am hardly the first person to see interesting parallels between this film and the paranoid thrillers of the 1970s, of which Three Days of the Condor – starring Robert Redford, making his presence in this new film especially resonant – was one of the best. Those films asked similarly complicated questions of us, and it’s a welcome surprise to see such weighty material handled in a genre that all too often focuses on silly God-like lunkheads from other planets. True, much of the dialogue is rendered in comic-book simple sentences (you can see The. Bold. Lettering. ), but that doesn’t detract from the complexity of the issues considered. What’s particularly refreshing, as well, is how beautifully Captain America: The Winter Soldier (and I haven’t even discussed that “Winter Soldier,” preferring to leave him as a welcome surprise for you) plays to an audience that has no interest in the overall “Marvel Universe.” I watched the post-credit sequence, in which Joss Whedon (director of The Avengers and its upcoming sequel) sets up additional characters to come – Quicksilver and the Scarlet Witch – and I thought, “who cares?” That thought, however, did not detract from the wonderful experience I had just had. I wholeheartedly recommend this film and hope it kicks Iron Man’s metal behind.